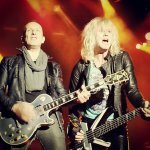 Def Leppard played the sixth show of the Summer Tour 2013 last night in Helsingborg, Sweden with a shorter setlist played. The band had a delayed flight and didn't start until just before 10:30pm meaning a shorter than expected show was played of just 14 songs. Many songs like 'Promises', 'GOW', 'BOTH' and 'Switch 625' had to be cut due to the late start. The show ended with the encore of 'Rock Of Ages' and 'Photograph' before the band came back for an unexpected second encore of 'Wasted'. Joe jokingly told the crowd the band had given the Mayor and police free T-Shirts and were then allowed to play one more song after the curfew time. The next show takes place on 3rd July in Uppsala, Sweden. Live Blog?.